Bill's OBX Beach Life: Ramp 34 Closed to ORV Permanently?! As locals and visitors line up to purchase ORV driving permits for Cape Hatteras National Seashore, ultimately, the next question to ask is "What will the permit offer me?" Between plover and turtle nesting closures, and other closures simply due to "in season" visitor traffic, ultimately there may not be much available to drive on anyway?! Most concerning has been a recent experience by Keith M who, upon purchasing a 2012 ORV permit, was notified that Ramp 34 will be closed to ORV traffic permanently! Not due to nestings, not due to seasonal visitation, but simply permanent closure to ORV starting in mid-April! A reevaluation was noted, but not for 5 years, and though mention of new ramps being opened, budget constraints and other issues will certainly stall any efforts. Ultimately, one of our prime wavesailing access ramps with a wide expanse of beach for clean SSW wind will be closed to ORV. Though pedestrian access remains open and will be the new intended focus of the Ramp, the hike is long to the waters edge. For wavesailing, we require a lot of equipment to haul out onto the beach. Varying winds require multiple sail and board sizes, and having it available from your truck on the beach is key. Now that will no longer be an option at one of our prime wavesailing launches. The positive..., a good workout even before hitting the water by hiking all the gear out!?! Beyond exercise though, I guess as the noose is tightened on ORV access, its simply inevitable. The Outer Banks is located firmly within reach of US mid-Atlantic metropolitan hubs and given recent medical, infrastructure, and housing booms over the past 15 years, it all boils down to regional access and population growth. Today's 2012 OBX is nothing like the OBX I first visited back in the early 1990s purely when looking at population numbers. Its not the same OBX as was here in 2000. Today's OBX is simply an extension of the mid-Atlantic metropolitan boom stemming from points west in Raleigh/Durham NC, to our northern neighbors from Chesapeake, VA to NYC, NY. There are simply a lot more people on the OBX today, and the Cape Hatteras National Seashore is no longer simply treated as BLM "all access" land anymore. As is consistent with the US East Coast, if you want free range to do as you please in open space land managed by the US Government, move west to where BLM land remains available. Here on the US East Coast, its simply no longer an option. The "environmental" and nesting bird concerns were avenues and now function as "fronts" for the true issue, which is population growth and managing/policing Federally administered land. No worries, its completely understandable, but unfortunately, its a losing battle for the ORV proponents. Population growth and access to the OBX is not going to diminish, and if anything, it will continue to expand. I just paid for my new yearly Cape Hatteras beach permit ($120 which expires Dec 31 12. not exactly a year) so i can have the privilege of never driving on ramp 34 ever again. Yep that's right .... the government closed the beach north of 34 permanently. thanks a bunch. That is our home beach ramp here in Avon, no more driving out to surf, fish, windsurf, or BBQ. I just hate having some bureaucrat making these kind of decisions. In a way this is a microcosm of whats going on in the entire US, bigger and bigger government, government for the sake of government. All the funds from the beach permit fees are being used for the administration of the permit! Not for park or visitor experience improvements. The NPS is actually bragging about this, hinting that the new permit administration isn't using any tax payer dollars, like that is some kind of huge achievement. What this is...is just another layer of bureaucracy and another incremental power grab. Pleading my case about how the Ramp 34 decision was a poor one, i was told that in 5 years there will be a review of the closures. How comforting. Legislation is the only way to correct this insanity. Please sign the change.org petition i posted earlier if you care about beach access here on Cape Hatteras. PETITION: The U.S. Senate: Remove The "ORV Rule And Provide Free And Open Access"
Sad and unfortunate. It's true when people say "it's a slippery slope". Thanks for the update Bill, but please don't go out of your way to justify these extreme government actions. Your population argument isn't even made by the government. They have controlled access with an expensive permit and have established numerical limits on the number of vehicles allowed on the beaches. With that it does not matter one bit how many people move near the OBX with those established controls. Assateague is much closer to many more people and they keep it open. And what big changes since the 90's? I've driven the beaches since about 1986(even drove my two-wheel drive to the pond. Remember the pond?) and the only big changes started when the bird closures forced crowding. I suggest OBPA submit a Freedom-Of-Information-Act request regarding the government decision to permanently close Ramp 34. I don't recall that in the plans made available for public comment. I feel terrible for anyone who try’s to earn a living down there. As the population ages, close and reasonable access will become even more important. This is not the Cape I started visiting in the 70’s. Note, these restrictions also apply to sound-side access as well. Therefore, for example, Kite Point will require permits for all vehicles which park out there on the sound side beach. Also Canadian Hole parking off the pavement will require permit as well. 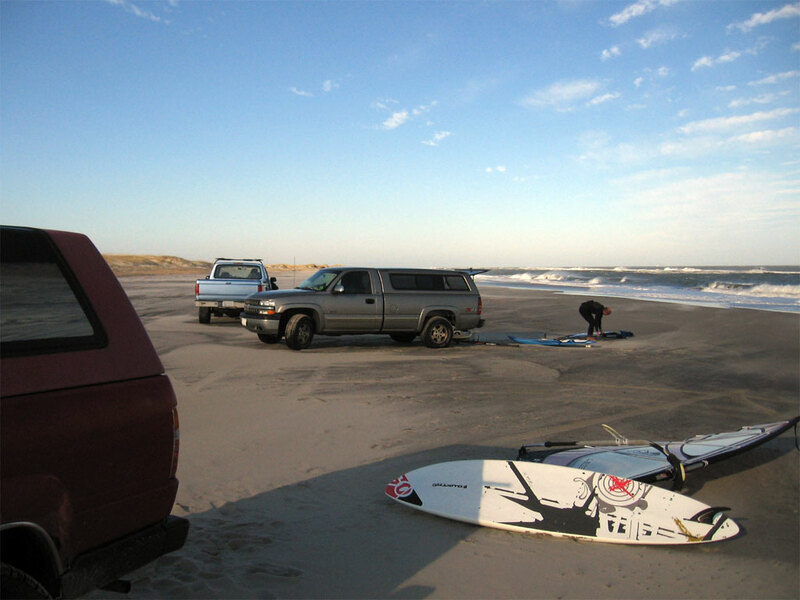 Heck we have better ORV access up here in Nags Head town limits with a $25 permit that last all "off-season" and with the new wide "nourished" beaches, there is plenty of space to drive and set up camp! Only downside are the houses which do block wind even if the beach is quite wide. Though true S wind will work in town, and the sand bars are quite nice! How are the Nag's Head beaches (replenished) for SUP (paddling)? Is it worth a drive from Avon? Are there life guard or other surfing restrictions? The replenished nags head beaches are great for SUP! No restrictions except for proximity to piers (must be no closer than 300ft, though often is rule is not enforced). The sand bars are quite nice since a large percentage of the replenished sand has moved offshore to form the bars. Given the predominant wind direction of SSW, it is near direct offshore, which is great for clean surf, but not best for wavesailing as there is not much wind inside. However, SUP sailing works well and I rode the SeaLion quite often last summer in Nags Head. Driving up from Avon could be worth it if the wind is S or SSW and you are looking for clean sheltered conditions (S to SSW in Avon will be side shore and bumpy). Plus the beach and bars in Nags Head are definitely nice now with the new sand. Additionally, I recently added a new web cam link listed under Web Cams on this blog (see right side bar). The cam is HD and located at Jennettes Pier, and displays an excellent view of the Nags Head surf conditions live! I will be checking this cam regularly throughout my day to see if its worth heading out to catch a "lunch break" sesh! Bill, the sign says closed to vehicles and PEDESTRIANS. Does that mean you can't even walk the beach? What is that all about? This Crap is happening in California too. Too many decisions made by people who don't even go to the beach. Those who do, protect it, and certainly aren't a nuisance. Cars might be one thing, but windsurfers and surfers? Give me a break! Please check your information. In new Park Service ORV plan it indicates that Ramp 34 is open to ORV's on a seasonal basis, November 1 through March 31. It is not closed permanently, only seasonally. The area is open to pedestrians year round. Please cite a online source stating Rmp 34 is seasonal. I have not found it, and all I have found is that the ramp is closed to ORV permanently. The ramp is now designated as a "pedestrian access only" ramp, similar to Ramp 2. Note, the initial closure of Ramp 34 occurred before March 31 2012, thus the seasonal closure statement seems off. Try www.nps.gov/caha go to ORV section, then Google Earth section, in Google Earth section double click the most recent highlighted date. I just checked and it was updated today showing Ramp 34 open to pedestrians. The beach north from 34 is marked as open to pedestrians, but the beach south of 34 to the Avon line is marked as closed to all entry. Correct, open to pedestrians. However, ORV use is banned at Rmp 34. From information out there, Ramp 34 is now "Pedestrian only" which is similar to Rmp 1 or 2. You still don't have it right. Check the ORv Map listed at the Park Service site previously mentioned. Ramp 34 through Ramp 38 is shown as seasonally open to ORV's November 1 thru March 31. Not ORV's "banned". Indeed, the Feb 2, 2012 update of the ORV Route Map shows Ramp 34 open Nov 1 - March 31. Note however, at Rmp 34 even with the seasonal opening Nov 1, there is no ORV access north of the ramp. I confirmed with the NPS directly that the seasonal opening only applies to the beach located in front of Avon village proper. Pedestrian access only/permanently for any points on the beach north of Rmp 34 drive out. That is correct. Which is different than "Ramp 34 Closed to ORV Permanently"
Note, that's why there is a question mark in the post title. However, as noted, access north of the ramp is closed permanently for ORV, and from the windsurfing wavesailing perspective, we always drove north off the ramp to spots free of the wind shadows produced by the buildings in Avon village proper. Rt 12 Open and the Missed Lighthouse Action! Ophelia Weekend Surf Visit on the OBX!